VIENNA - "You know you've lived in Vienna too long," an expat once told me, "when you start scowling at children having fun." More than any other European capital, Vienna has always been a grown-up sort of place. Its attractions center around staid tradition and somber culture: music, coffeehouses, art. It was never a place that seemed to welcome kids. But the city of Kaisers and opera has done an about-face. The historic center is packed with strollers. One of the city's most popular attractions, Schönbrunn Palace, is visited more for the world-class zoo on its grounds than the rooms of antique furniture inside. At the insistence of Vienna's mothers, shiny glass elevators have been installed in most U-Bahn (subway) stations. And many of the numerous swim-baths, once populated largely by people over 40 counting their laps, now try to attract families, with paddling pools for babies and diving boards for kids. The changes aren't all on the surface. While there is more for children to do in Vienna, the underlying attitude toward them also has shifted. In Café Diglas, one of the city's oldest coffeehouses, once standoffish waiters now wiggle chairs out of the way to make room for strollers and playfully wave their fingers to distract unhappy babies. Vienna's older grand dames used to reserve fearsome scowls for noisy children, but on a recent trip I twice had these respectable ladies poke strangers on trams and trains: "Let the mother and baby sit down," they commanded, and then spent the rest of the trip exchanging smiles with my 8-month-old son, John. "Has it changed as much as I think it has," I kept asking friends, uncertain whether I was simply seeing the place with new eyes after a separation of 10 years and with a baby in tow. "It's the European Union," one Austrian friend said. "The Viennese are finally realizing they have to change." An American who's lived in the city for some 20 years had a simpler take. "Oh, it's definitely different," he said as we took our two infants for a walk. "All those old grumpy people died." Whether it's the EU or simply a shift in population, Vienna has become one of the most welcoming cities in Europe for families. It would have been easy to bypass a visit to Schönbrunn Palace, that Versailles-like pile belonging to long-gone empires. Who needs to see rooms full of fancy furniture and gold leaf? That was before I talked to friends who live in the area with their toddlers. Just go for a walk on the grounds, they said. It's fun. Vienna? Fun? So we went. Schönbrunn's carriage-wide gravel paths that were built to impress Europe's elite now accommodate strollers. Then there is the palace's attraction as home to the world's oldest and arguably greatest zoo: the Tiergarten Schönbrunn. Our friends take their kids there almost weekly, and they never tire of racing the emus up and down the paths or visiting the newborn polar bears. Schönbrunn is just one of the city's many green spaces. Vienna Woods, or Wienerwald, is another. Hop on bus 38A at the end of a U-Bahn line and in 20 minutes you're deep in the woods, at the top of Kahlenberg, with a view of the Danube and the city set off by intense green hills and neat rows of private vineyards. Vienna has always had a timeless, fairy-tale quality. We joined families walking and cycling a shady paved path bordered by lilacs and forget-me-nots. An hour of determined strolling took us to the back end of the village of Grinzing, where one heuriger after another lined the main street. Heurigen are uniquely Austrian restaurants that serve only their own wine and buffet-style food. They make you believe the locals really do live the good life, and their laid-back atmosphere is a boon for parents. We crunched through the tree-shaded beer garden to a wooden picnic table and exchanged greetings with relaxed strangers. A grinning waitress in traditional Austrian dress took our orders for weisswein g'spritzer (the heuriger's white wine mixed half-and-half with mineral water) and tickled the baby perched on the smooth wooden table. Being back in Vienna suddenly felt surreal, as if the Viennese had been taking classes in friendliness and baby-worship from the Italians. This was not the reserved city I knew a decade ago. The coffeehouses have nonsmoking sections, families are welcome, and tourists are forgiven for not knowing how to order in the local dialect. The Viennese will meet you most of the way if you make a little effort. If you can't get the pronunciation of please and thank you right, you can always fall back on a parent's universal language - a smile. Antonia Malchik can be reached at amalchik@gmail.com. ZOOM Kindermuseum Entertainment and education for kids up to 12. Adults $5, children $6-$8. 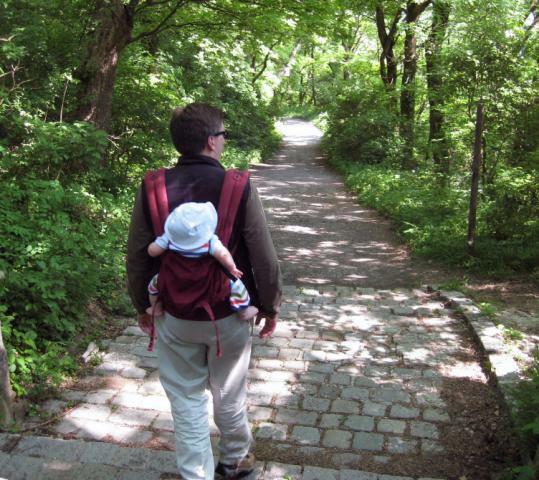 Tiergarten Sch�nbrunn Sch�nbrunn Palace, 13th District 011-43-877-92-94 ext. 500 zoovienna.at The Vienna Zoo includes a rainforest house and a pair of polar bear cubs. Adults $19, ages 6-18 $8, 5 and under free. Kahlenberg Vienna Woods (Wienerwald), 19th District A mountain with country walks and fantastic views of the city. Take the U4 U-Bahn line to Heiligenstadt and catch bus 38A to the Kahlenberg stop. Hotel K�rntnerhof Grashofgasse 4, 1st District 011-43-512-19-23 karntnerhof.com Welcoming to children. Including buffet breakfast, singles $106, suites $391. Hotel-Pension Suzanne Walfischgasse 4, 1st District 011-43-513-25-07 pension-suzanne.at Family-friendly hotel near the opera house. Single rooms $123, apartments $188. Caf� Diglas Wollzeile 10, 1st District 011-43-512-57-65 diglas.at One of the city's most well known and elegant coffeehouses. Sit and have a m�lange coffee. Reasonable a la carte and three-course menus for $19. Waldtzeile Speisinger Strasse 2, 13th District 011-43-804-53-94 waldtzeile.at Children can run around the fenced-in garden and play with the house puppies. Three-course lunch and dinner menus for $15-$20.